You have dreamed about striping your own bike lane on your most-traveled routes. You got your street closed off for a block party. Maybe you even spent the afternoon feeding the meter on Park(ing) Day. You just may be the next tactical urbanist to join the ranks of those who make it their business to make their cities better. These aren’t necessarily the ones who sit in community meetings and focus groups, hashing out city-drawn plans that will sit on the shelves a few years (or decades) longer. Tactical urbanists are the doers. Some transportation chiefs like Janette Sadik-Khan and Gabe Klein are doers, but you don’t need to have a top job in a major metropolitan transportation department to transform your street. You just need to be a bit of a badass. Mike Lydon of the Street Plans Collaborative is sort of the godfather of the tactical urbanism movement. Some people can’t visualize change until they see it themselves, he told a packed forum yesterday at the National Building Museum in Washington, DC. But once they see it, they don’t want to go back. Well, you may be thinking, it’s all fine and good to get your ya-yas out for a day by doing some guerrilla gardening or what have you. People who are serious about improving their cities are just going to have to suffer through those community meetings and go through the proper channels. But Lydon says DIY urban improvement isn’t just immediate – it can be lasting, too. In fact, most of the time, these overnight streetscape changes are made to get the attention of officials with the power to make them permanent. Even Portland’s Depave group, which literally takes a jackhammer to asphalt they don’t like, now gets funding from the city. Is there a danger of cooptation when the government starts funding and partnering with these guerrilla movements? No, Lydon says: Most of the time, getting the attention and support of people in power is the whole idea. Lydon uses the Dallas “Build a Better Block” experiment as his starting point. It started with a few neighborhood activists in Dallas, and they had an old mixed-use block. Unfortunately, the street had been turned to one-way, three lanes, the storefronts were all vacant, and they wanted to show the city that there could be positive change. So what they did, very intelligently, was they circled all the ordinances they were intending to break with this intervention. They took the road down to two lanes, they added bike lanes, pop up cafés, street dining, music, all these things to enliven the street. And when the neighborhood slowly filtered out and started to realize what that street could become, the city council person got behind it and said, “This is really amazing. Why can’t we do more of this?” And they’d already circled all the examples of why. This is why. This is forty years of institutionalized policy and ordinances that don’t even allow us to try to create this scenario on a permanent basis. And that had a really big impact in Dallas. In fact, the city took back jurisdiction over the street from the state highway system and made the bike lane permanent. Planning student Matt Tomasulo had similar luck in Raleigh, North Carolina. Frustrated with the city’s foot-dragging on implementing the wayfinding in its own bike/ped plan, Tomasulo designed and posted signs himself, complete with a scannable QR code. The city first declared them illegal and told him to take the signs down – and then changed course and asked him to put them back up. Of course, sometimes these changes do come from the top. Lydon used the example of New York’s Times Square, where visionary transportation chief Janette Sadik-Khan began to tranform a congested, pedestrian-hostile place into a car-free zone starting with nothing but lawn chairs. Since some people will always freak out when the streets change, it was important to reassure them that nothing had been done that couldn’t be undone just as fast. But people loved it. So then planters and tables came, and next, the asphalt will be replaced by concrete. But most of the time, these actions are unsanctioned. That means anyone can take a can of paint and install a crosswalk, or grab some construction cones and close off their street to car traffic. Who will be the next person to transform a neighborhood? Will it be you? People taking control of their lives make the future. 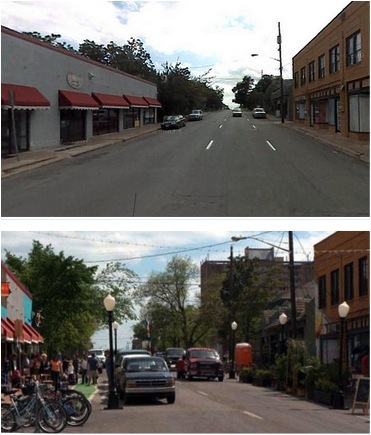 Quick clarification: the results of the initial Dallas Better Block intervention is confused with one in Forth Worth, which is where the city reclaimed jurisdiction to stripe bike lanes. 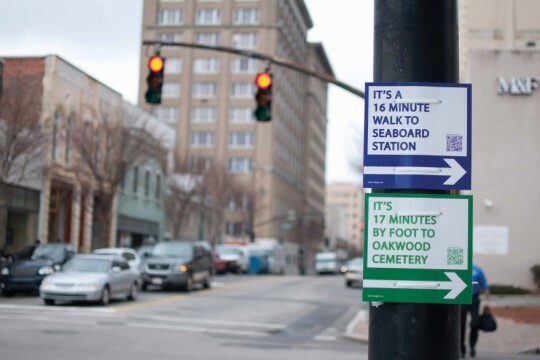 It’s crowd-sourced urbanism in action! It is exciting to see urbanism and planning across the U.S. swept into this global paradigm shift where grassroots action + technology is stimulating political and cultural changes. An open question is how (or will) the planning establishment be able to embrace this and take the lead, or lag behind the public consensus as in the case with Raleigh, NC planners as noted in the article. Also, hasn’t this been a more dominant paradigm outside of the U.S./E.U. axis? I think this is another example where we could learn a lot from our peers in developing nations who have had to make due with DIY infrastructure to accomodate rapid urbanization in cities across the globe. Lots of “regular people” are more creative than the city leaders who only see a street as its always been. “Regular people” are often better at imagining what it could be. Sure, go ahead if you want to commit crimes, interfere with official plans for locations, make some people made because they had different ideas, become liable for injuries, both physical and financial, that your plans cause, and be fined and forced to pay to restore the location back to what it was before. But hey why don’t you go ahead and put in an illegal crosswalk or two, maybe paint red curbs so no one can park in front of your home/business, issue assigned parking on public streets, put in your own parking meters, etc. What we DON’T need is a small group of people taking it upon themselves to force everyone else to comply with what THEY think should be done. There is a public process for a reason. Safety and consideration of others is the primary reason. Encouraging illegal behavior is wrong. You’ve used some pretty interesting euphemisms in this piece: ‘Unsanctioned’ instead of illegal or criminal, and ‘tactical urbanist’ instead of ‘vandal’. Vandalism isn’t anything new. It’s been around for centuries. Calling it by a different name does not make it a different thing. I think you mean dumbass rather than badass. Incidentally, it is illegal to incite others to take imminent illegal action. It’s probably not a good idea for the author to expose herself to liability like that. In contemporary society, speeding and other dangerous driving is ubiquitous, and enforcement of these traffic crimes is nil. Even when a motorist kills while perpetrating such crimes, police don’t cite and DAs don’t prosecute. There are lots of laws out there, but no credible enforcement of the important ones. Call it vandalism if you will, but these acts seem to be a product of our society where motorists run amok. Where the death toll on American roads in three days is greater than that of 10 years of war in Afghanistan. Where more people are killed on roads each month, every month, for the last 50 years than were killed by terrorists on Sept 11, 2011 – yet there is no outcry for change. My hero does not carry a rifle to a foreign land to kill insurgents in the name of freedom. 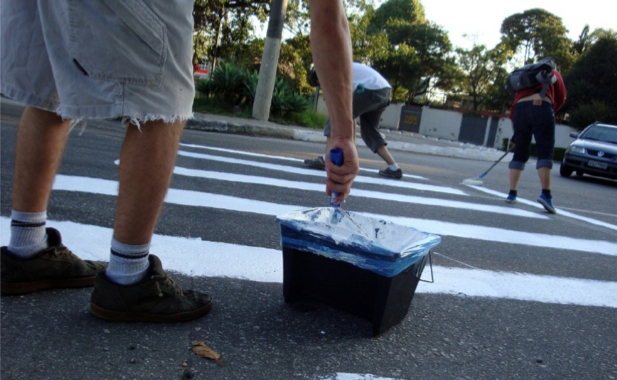 My hero wields a paint brush so my child and my neighbor can cross the street safely. @Iceman_v_1:disqus : Nothing imminent here; this is first amendment protected free speech. And yes, there is a difference between vandalism and the sort of acts described in this article; vandalism is about destruction, and there is nothing destructive here. Yeah. I mean, can you imagine what our cities would look like if we had spent the last eighty years letting small groups of often unelected people make key decisions about land use and transportation, based solely upon their own opinions about how the built landscape should look and function? Thank heavens that never happened! What’s to prevent the anti-bike faction from doing its own streetscaping and, for example, painting out a bike lane? Why do you assume that only the “good guys:” will do this? “When the last law is done” we will be completely unprotected from rule by brute force. God help us if that happens. That day, people will drive right up on the sidewalk and kill us, and not even receive a fine for littering the streets with our carcasses. Oh, wait. That already happens. Lovely sharing thanks for sharing…. When the regular folks, who see and approve of the DIY actions, outnumber the enforcers of the current rules, that is exactly what they are saying. We live in a country of majority rules, why cannot we get back to that. What are the unsanctioned forms you mentioned? Dongho Chang belongs to a new generation of transportation engineers who see their job as more than moving cars. His work with Seattle DOT has established the city as a national leader on designing multi-modal streets. We recently spoke to Chang about his work in Seattle and how the profession is changing. “Pocket” Bike Lanes: A Small Step to Make Intersections Work Better?